Mediocre novels made into a dreadful TV series: what fun! I'm suffering from a terminal case of Retention of Disbelief. There are plenty of entertaining aspects to this series, particularly the novels (more on why the TV series is awful later). It’s an intriguing idea, to wake up in a strange town and feel that, a la The Truman Show/The Matrix/etc., something’s rotten in the state of Idaho. It’s classic melodrama (if not creative) gold, to have both the wife and the Other Woman orbiting a single cleft-jawed man, occasionally colliding with each other as they vie for supremacy behind the scenes. So I can understand—sort of—why the story has achieved such popularity. Which problem to tackle first? Ah, yes, the vaunted “time travel” hook. Imagine you’re a living human being in the early 21st (or late 20th) century, and a genius comes along offering you the chance to sleep through the next 2000 or so years. Sure, it’s an untested cryogenic procedure that they estimate will have a small, say 1~3% failure rate, but hey, it’s worth it to see the future, right? Wrong. Virtually no one would agree with this, because it’s bananas. Let’s leave aside the small but—I think you’ll agree—critically important chance you could go from being alive to being dead due to equipment failure, etc. There’s still the obvious opportunity cost: virtually everyone you know, all the other people who gave your life meaning, will be left behind. On top of that, why trade a world you understand for one you can’t even begin to anticipate? That sounds like a high-risk, no-return nightmare come true. “Maybe some of the people in the ‘Mountain’ were just loners or didn’t have anyone binding them to their original time! Besides, I’ll bet you’re just angry because you didn’t figure out what was really going on!” I can hear the true believers crowing triumphantly, and you’re right—I certainly didn’t guess where Crouch was going with his story. I also utterly failed to hypothesize that all the characters were made out of cottage cheese, and would have been just as surprised to hear that was the case—why? Because neither the cottage cheese hypothesis nor the “let’s go into cryogenic status for a couple thousand years ‘to save the human race’” make any sense at all. So, even if it were the case (and it’s not!) that plenty of people would join Pilcher and gamble on this bonkers plan, there’s still a major problem with the salvific overtones of Pilcher’s mission. He claims the human genome is degrading (do you know what that means? Funny, I don’t either) due to environmental problems, so they can just sleep through a few millennia and emerge to restart the human race, once all that environmental stuff clears up. Hey you, true believers—how’s he going to do that with less than 1000 people? Genetically speaking, I’ve heard from reputable sources (like Gaius Baltar!) that you need a lot more genetic diversity to avoid extinction. Pilcher was enough of a Brainiac to figure out the human race was doomed, but didn’t consider the long-term implications of a population that is too small? Doubtful. And besides, nobody acts “to save the human race” in the abstract, they act to save those important to them personally. The idea of joining Pilcher’s little time capsule goes against everything we know of human nature. “You’re missing the point—the time travel thing is just the initial premise. The real story starts in the town—it’s all about the people trying to figure out what’s wrong in the world!” True enough, but that brings up all the other problems in the story that I just can’t get beyond, disbelief-wise. 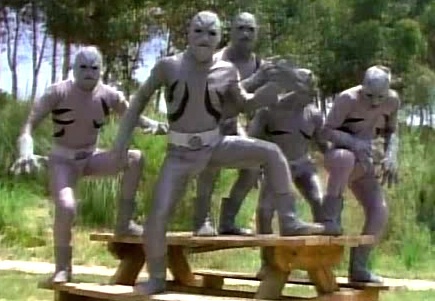 Exhibit A: the aberrations. Supposedly the product of evolution and the “degrading” of the human genetic profile, in less than 2000 years humankind has transformed into the ‘ultimate killing machine’? Please. It’s taken humankind like a gazillion years just to get rid of their tails, and we still have a little bone thingy! But practically overnight, the remnants of humanity have morphed into lethal predators? That’s just a ridiculous idea. That being said, in the novels we get rather vague descriptions of monsters with talons, etc., and can visualize them how we wish (that’s one of the advantages of the medium of the written word, and Crouch takes advantage of that medium to play certain tricks that would never work in a visual medium, like having the enigmatic scout turn out to be a character we already know). But in the TV show, we got this. Compare these two images next to each other, and tell me they’re not practically the same! Somebody get "Abby" an appointment with a dentist! Go Go Power Sheriff Burke! It’s time to tackle Exhibit B: the town itself. Why rebuild a town? Pilcher claims it’s to ease the transition, but why, in the name of all that’s holy, did they waste time recording cricket noises and make street signs and useless crap? They’re preparing for an unknown world, but they waste all these resources on ephemera due to one idiot’s fantasy that people might be upset about the world once they wake up? For the record, Pilcher was wrong anyway, because when people did start to commit suicide in droves, it was the incredible loss of everyone they knew and loved, not the thought of no more white picket fences or the knowledge that the world was harsher now, that threw them into despair. 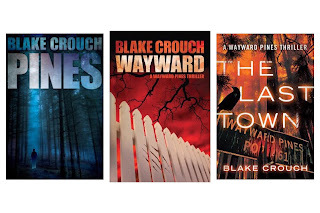 The town makes no sense, but (I presume) Blake Crouch wanted to create a dystopian environment and perhaps didn’t care too much about the verisimilitude along the way. Still, at least in the books the town situation has some depth, as does the quest to find out the truth; in the TV series, it’s devolved into nothing more than a ridiculous high school Lord of the Flies-esque drorror (drama + horror) story (one bereft of the main protagonist, no less!). Ugh. When Matt Dillon, as Ethan Burke, has his cathartic “I Am Legend” Neville/Will Smith moment—another gross distortion of the original literary work on which it is based, in point of fact!—I wanted to kick the entire writing and production team responsible for the crap-fest of the TV series down the elevator shaft with him (especially the ultimate scapegoat, Hollywood punching bag M. Night Shyamalan). But if the show had had mercy on its viewers and crawled off somewhere to die an ignominious death, it would’ve been palatable; instead, we discover that the teenagers are running the town now. I mean, I’ve seen Between, another show centered around the Lord of the Flies framework; if I wanted terrible non-entertainment, I could get a festering heap-full from Between, and certainly don’t need a double helping from Wayward Pines. 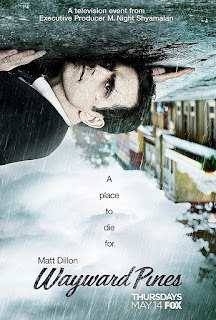 In conclusion, despite my utter inability to suspend disbelief with the ‘scientific’ elements of the Wayward Pines trilogy, I will freely admit to enjoying some aspects of the books, and would even go so far as to dub them “not terrible”. Not so the TV series, which tramples on the ho-hum story and turns it into something truly, unforgettably dumb. And by the way, how could they humanize Pam, of all people? 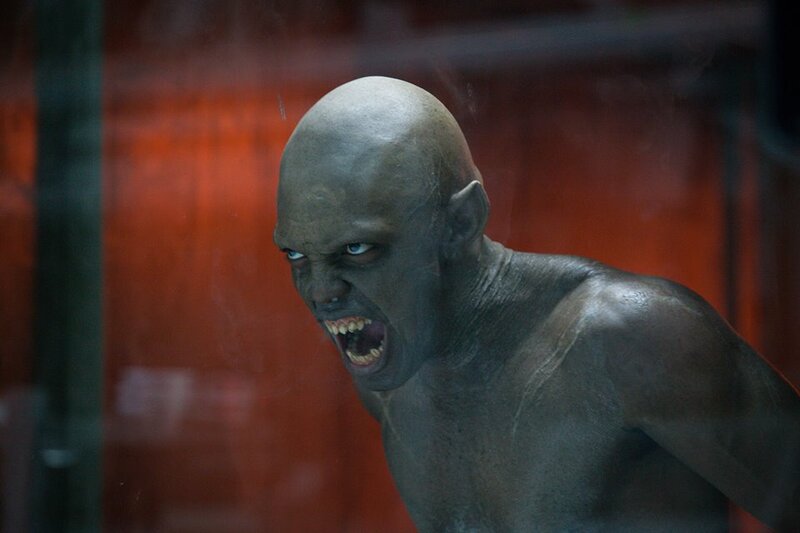 If I were Crouch, I would definitely be egging the houses of everyone involved in the TV series! Finally, a call to rhetorical arms: there are apparently thousands of genuine fans out there for both the mediocre novels and the dreadful TV series, so my challenge to you is: what’s the appeal? I’m willing to listen, and/or possibly even be convinced I’m wrong about all this, if you’re persuasive enough! Zhaoyun, champion of the hard truths for literally dozens of readers worldwide, has been reviewing much better science fiction and fantasy literature and films for Nerds of a Feather since 2013.